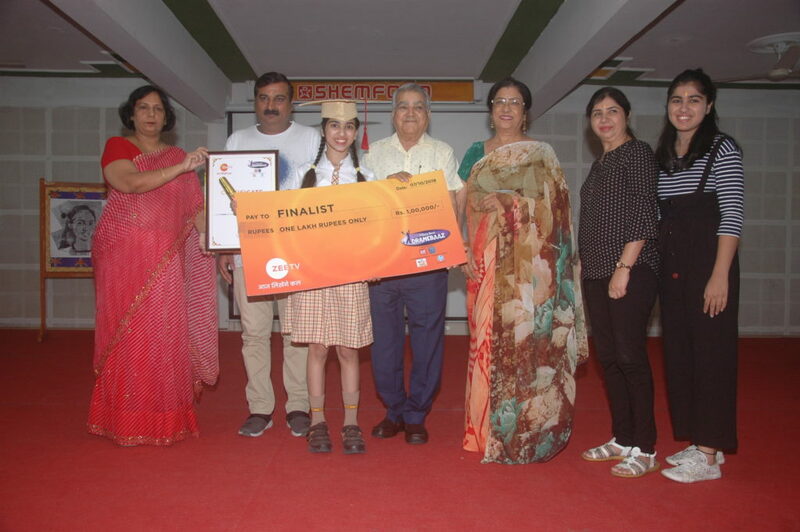 Shemford Futuristic School, Pinjore welcomed Shemstar Angelica Piplani when she returned after clinching the 4th position and a cash prize of One Lakh rupees at India’s Best Dramebaaz, 2018. The incandescent artiste dazzled the stage of the popular TV show ‘India’s Best Dramebaaz’ with her expertise. The versatility of this budding artist has always mesmerized the audience. Angelica has always proved herself in all the fields, both scholastic and co- curricular. Her knack for acting was recognized in her early years when she was given a platform in school programs. It was from here that she alighted her flight to success. This young and aspiring Shemstar has also enacted in short films and documentaries. It was indeed a proud moment for all her supporters at Shemford, Pinjore when she was among the top 16 contestants in India, after having cleared many rounds of auditions, competing with thousands of other contestants from all over the nation. Right from her auditions to the last act of the show, ‘Maths ki Mahagyani’ Angelica Piplani, was applauded by the judges to be a fine actor in both grave and comic roles. Throughout the season, she was acknowledged for her talents-acting and mathematics-by all the celebrities, who also tested her mathemagic skills personally. It was a long awaited moment to welcome our Shemstar with grandeur. Principal Ms. Amita Dhaka remarked that Angelica had proved to all the children in the tricity, that, at Shemford, the skills of the children are chiseled with great care so that they are groomed into all-rounders. Angelica Piplani was taken by surprise with the warm welcome she received at school. Tears rolled down her eyes when she saw the video prepared on her journey from school stage to India’s Best Dramebaaz at the National level, from receiving prizes at the school level to receiving accolades and honours from different celebrities in the reputed show. Her peers and teachers also prepared poems for she has set an example that success results when you put your heart, mind and soul into your smallest acts, it comes with positive action combined with positive thinking. Dr. D.R. Arora, Chairman, Shemrock and Shemford Group of Schools, felicitated the young Shemstar for her achievement and added some lighter moments by sharing jokes with the students. Dr. Mrs. Bimla Arora, Director, Shemford Futuristic School, Pinjore, added, that there is no minimum or maximum age to achieve success. If one has love, dedication and passion towards his work, he can prove himself to be a ‘Scintillating Star’ in his field of interest like our very own Shemstar, Angelica Piplani. All the members of the school, Management, Principal, teachers and students congratulated Angelica for having scaled such great heights at such a tender age.